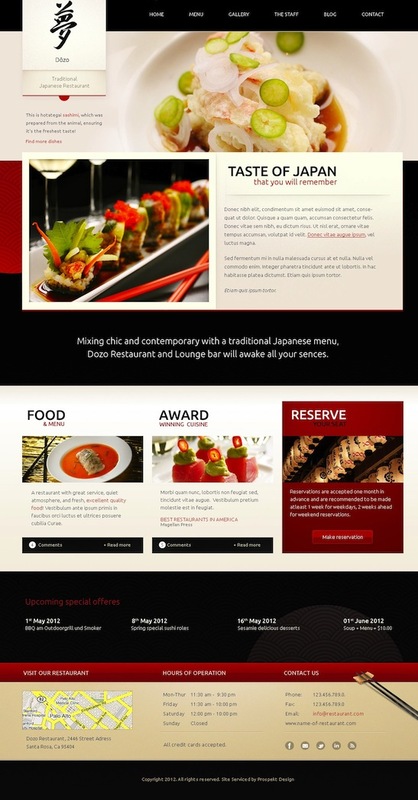 Taste of Japan classy and tasty WordPress Template perfect for presentation of your restaurant, pubs, bars, wineries and other companies offering foods and drinks. Each page has unique layout created to best display data in well organized and visually attractive way. Clean and creative design is planned into details to make your meals and restaurant offer leave outstanding impression on visitors. Theme offers range of possibilities to publish on your site such as: upcoming events, menus with prices, detailed galleries with recipes, team members and awards and blog posts. Taste of Japan ( TOJ ) theme offers an excellent system for administration of menu items ( creating and categorising food menu & drink menu). The theme is highly optimized for search engines and has been programmed in a way that it is easy to change content so it best represent your business.